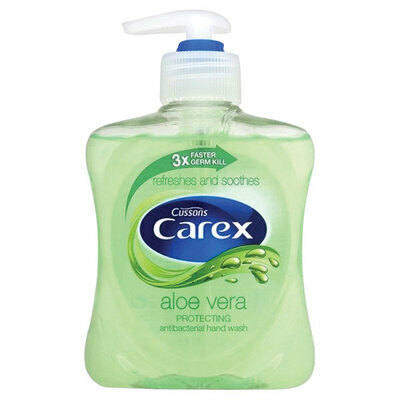 Developed by one of the leading brands in sanitization, the Carex Handwash Aloe Vera delivers powerful and effective antibacterial power from the very first pump. Suitable for use in bathroom, kitchens or other rooms where contamination control is of heightened importance, this nourishing handwash is packed with natural Aloe Vera - renowned for it's moisturising and supple effects your skin. Specifically formulated to prevent the spread of bacteria, this dermatologically texted liquid has an added non-drying formulation that maintains the skin's natural PH levels and reduces the risk of cracked hands from over-washing. An ideal choice for larger care homes or nurseries, this specific pack comes with six 250ml bottles, ideal for dotting around your establishment and ensuring optimal hygiene in every location. For an alternative option, we also stockCussons Mild Cream Soap offers a solid alternative to liquid washes.